张家其(1986-), 男(汉族), 湖南省醴陵市人, 博士, 副教授, 从事精准扶贫研究。E-mail:594089143@qq.com. 朱烜伯(1985-), 男(汉族), 江西省南昌市人, 博士研究生, 从事人居环境研究。E-mail:51658904@qq.com. 第一作者：张家其(1986-), 男(汉族), 湖南省醴陵市人, 博士, 副教授, 从事精准扶贫研究。E-mail:594089143@qq.com. 通讯作者：朱烜伯(1985-), 男(汉族), 江西省南昌市人, 博士研究生, 从事人居环境研究。E-mail:51658904@qq.com. Abstract: [Objective] To explore whether the relationship among ecological protection, production development and life improvement can be coordinated in the process of poverty alleviation and development in Tujia and Miao Autonomous Prefecture in Hu'nan Province, in order to realize the centralized integration of poverty alleviation resources and seek the appropriate model for poverty alleviation and development in poverty-stricken counties in key ecological functional areas. [Methods] Based on the precise poverty alleviation strategy in combination with the living, production and ecology win-win theory, the poverty alleviation evaluation index system was built, and the weight of the index was determined by objective and subjective weighting method. Then the production, living and ecology index and comprehensive poverty alleviation performance index of the research area from 2010 to 2016 was calculated. [Results] ① The poverty alleviation performance in West Hu'nan Province had been improved, and the comprehensive index of poverty alleviation performance had increased by 2~4 times in the past six years, especially after the implementation of the precise poverty alleviation strategy. ② The production index in poverty-stricken areas had increased by 5.8 times on average, which was the fastest, but the research area should not focus on production development while neglect the improvement of living and ecology. ③ Poverty alleviation and development in poverty-stricken counties in key ecological functional areas should consider regional characteristics and coordinate the relations among production, living and ecology so as to achieve sustainable development. [Conclusion] The primary task of poverty-stricken counties in the key ecological functional areas of West Hu'nan Province is to get rid of poverty, but the protection of ecological environment and the improvement of living conditions are equally important, beyond economic development. 王丛虎. 续写脱贫攻坚新篇章:解读十九大报告扶贫攻坚战略思想[J]. 源流, 2017(11): 4-5. 张琦, 陈伟伟. 连片特困地区扶贫开发成效多维动态评价分析研究:基于灰色关联分析法角度[J]. 云南民族大学学报:哲学社会科学版, 2015, 32(1): 136-142. 陈小丽. 基于多层次分析法的湖北民族地区扶贫绩效评价[J]. 中南民族大学学报:人文社会科学版, 2015, 35(3): 76-80. 游新彩, 田晋. 民族地区综合扶贫绩效评价方法及实证研究[J]. 科学经济社会, 2009, 27(3): 7-13. 王建平. 连片特困地区政府扶贫资金的减贫效果评价:以川西北藏区为例[J]. 决策咨询, 2015(2): 40-42, 48. 王碧玉, 李树吉, 李成红. 财政扶贫资金效益评价模型的构造及其应用研究[J]. 东北农业大学学报:社会科学版, 2007, 5(4): 75-77. 向延平. 武陵源世界自然遗产地旅游扶贫绩效模糊评价[J]. 中南林业科技大学学报:社会科学版, 2012, 6(6): 5-7. 安志杰, 包纪祥, 杜世德. 科技扶贫成效综合评价研究[J]. 西北农林科技大学学报:自然科学版, 1993, 21(2): 82-88. 郭建宇. 农业产业化扶贫效果分析:以山西省为对象[J]. 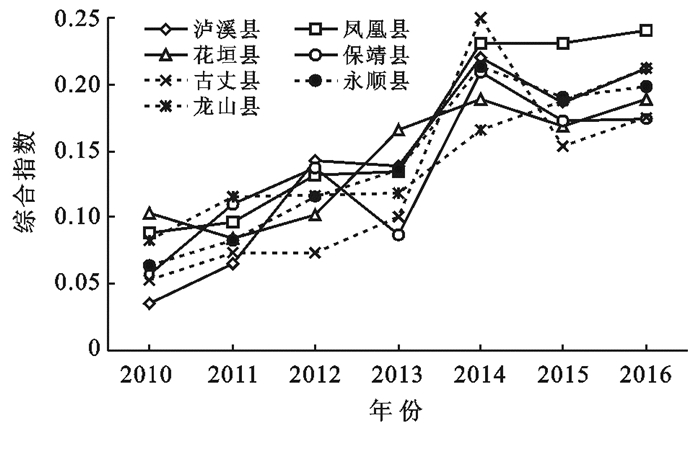 西北农林科技大学学报:社会科学版, 2010, 10(4): 20-26. 田大庆, 王奇, 叶文虎. 三生共赢:可持续发展的根本目标与行为准则[J]. 中国人口·资源与环境, 2004, 14(2): 9-12. 林闽钢. 中国农村贫困标准的调适研究[J]. 中国农村经济, 1994(2): 56-59. 汪三贵. 中国农村的贫困问题[J]. 农村经济与社会, 1991(6): 1-10. 庄天慧, 张军. 民族地区扶贫开发研究:基于致贫因子与孕灾环境契合的视角[J]. 农业经济问题, 2012(8): 50-55, 111. 祝慧, 莫光辉. 精准扶贫的阶段性成效与创新突破[J]. 经济纵横, 2016(7): 53-57. 张家其, 吴宜进, 葛咏, 等. 基于灰色关联模型的贫困地区生态安全综合评价:以恩施贫困地区为例[J]. 地理研究, 2014, 33(8): 1457-1466. 张家其, 段维维, 朱烜伯. 湘西农村贫困地区人居环境综合评价[J]. 企业经济, 2018, 37(9): 176-181.